Eye problems account for approximately 6% of all attendances to an Emergency Department (ED) in the UK1with an incidence of 17.2 ophthalmological emergencies per 1000 population per year. Injuries account for the nearly half of the total2.Although around two thirds1 of all eye problems are managed solely by the ED, a survey of senior house officers in the UK in 1997 found that almost 69% had little or no confidence in dealing with eye cases. Also 42% had no access to a slit lamp and 26% had received no training in ophthalmic emergencies in their post4. This lack of knowledge is reflected by studies highlighting poor assessment and examination of patients with eye problems presenting to the ED. In one, a third of patients did not have their visual acuity tested3 and in another, 19% of histories and 59% of examinations were judged to be inadequate5. Finally, another study demonstrated that emergency nurse practitioners out-performed junior doctors in all aspects of eye assessment and diagnosis6. Although two thirds of all eye problems can be managed solely by the Emergency Physician, equipment and training are deficient and clinical assessment by junior doctors is poor. No assessment of eye problems can be undertaken without a knowledge of the basic anatomy of the eye.The majority of eye problems presenting to the ED relate to the anterior eye the cornea, conjunctiva and eyelids are common sites of injury and infection. 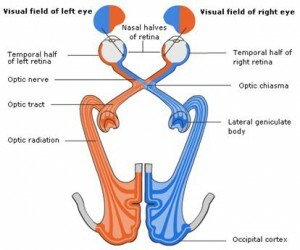 Visual disturbance can arise as a result of a problem with any structure along the visual axis or neural visual pathway. Any patient assessment in the ED must begin with an ABC assessment. Between 40 and 60% of all eye problems are trauma related and therefore consideration must be given to the rest of the face and head, airway, cervical spine and any other related injuries. 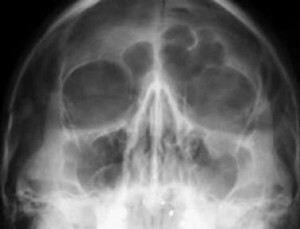 An ophthalmological history covers not only presenting symptoms and previous eye problems, but must also consider whether an underlying systemic disorder is present. Does the disturbance affect one or both eyes? Acute bilateral eye pathology is rare and often a hemianopic patient will complain of visual loss in one eye rather than both. How quickly did the disturbance appear? A rapid onset suggests a vascular problem or retinal detachment. A slower onset suggests a more chronic process such as a space occupying lesion. Is the disturbance partial or a complete loss of vision? Complete loss of vision in one eye localises pathology to that eye or optic nerve (e.g. retinal artery or vein occlusion). If the disturbance is partial, what form did it take? Although it is tempting to try and differentiate between viral and bacterial conjunctivitis based on the history alone, no reliably accurate method exists7. It is important to attempt to differentiate blunt from high velocity or potentially penetrating trauma. Significant blunt injury to the eye often occurs in association with assaults and in sporting situations from direct impact by a ball. Activities associated with high velocity fragments hitting the eye include angle grinding and use of a metal chisel with a hammer. Visual acuity is a simple and useful measure of the ability of the eye to resolve fine detail. It is an essential component of the assessment of all patients with an eye problem presenting to the ED. Traditionally, it has been tested by asking the patient to read letters (known as optotypes) from a chart commonly the Snellen chart. 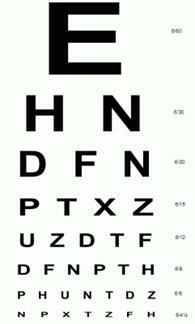 Although widely available in EDs, the Snellen chart method of acuity measurement is prone to error. One survey found that chart distance and illumination varied enormously8.It is important that the Snellen chart is separately illuminated as, for those with poor vision, increasing illumination may improve accuracy by up to one line9. The recommended illumination of 480 lux10 can be achieved by directing a spotlight at the chart. Also, technical problems occur due to the progressive increase in the number of letters down the chart. This leaves patients with poor acuity fewer letters to identify and a visual crowding of letters lower down the chart11. These problems have been addressed by the development of newer charts (e.g. LogMAR) with identical numbers of letters on each line and greater accuracy of measurement12. When measuring visual acuity it is vital that the chart is the correct distance away from the patient and independently illuminated. The pinhole only allows parallel rays of light through, which pass straight through the cornea and lens without bending. Therefore an unaltered image is presented to the retina. If acuity improves with the pinhole, the visual impairment is refractive and not due to an intrinsic eye or neurological disorder. Use of a pinhole occluder corrects for any refractive error and enables a true visual acuity to be measured. Alternative eye testing charts are available which use either a shape orientated chart (e.g. illiterate E chart) or pictures to assess acuity. If acuity is so poor that the patient cannot see the top line of the chart then assess at 3 metres ensuring that this is documented as 3 / x.If no letters are seen at the shorter distance, the next step is to assess ability to count fingers (recorded as CF). If finger counting fails, then assess ability to perceive hand motion (HM) and finally, if unsuccessful, ability to perceive light (LP). 2.The patient cant open their eye due to photophobia or involuntary closing of the eyelid (blepharospasm). Start by examining the face for skin lesions and rashes particularly if in a dermatomal distribution suggesting varicella zoster infection. Lymphatic drainage of the eyelid and conjunctiva is to the pre-auricular and submandibular lymph nodes which should be palpated for lymphadenopathy. The temporal arteries should be felt for tenderness and the trigeminal and facial nerves examined for intact function. The bony orbit and zygomatic complex should be palpated for swelling, tenderness, palpable fractures and subcutaneous emphysema. Check for intact sensation in the supra- and infra-orbital nerve distributions (the forehead above the eye and the cheek and upper gum respectively). These cutaneous nerves are particularly susceptible to injury from assault, as they emerge through foramina immediately above and below the eye. Any generalised or local swelling should be identified. Note the position and symmetry of the eyelids ptosis (e.g. third nerve palsy) or retraction (e.g. exophthalmos), entropion or ectropion. Any wounds must be examined carefully to identify depth and extension to the lid margin and possible involvement of the lacrimal apparatus. The globe may appear to be protruding (e.g. retrobulbar haemorrhage) or sunken (e.g. Horners syndrome). An initial examination of the visible conjunctiva and cornea (palpebral fissure) should identify general or localised swelling, colour, bleeding and clarity of the cornea. Note the distribution of any redness or prominent blood vessels of the conjunctiva (conjunctival injection) generalised injection suggests conjunctivitis, localised is a sign of scleritis and episcleritis and perilimbal (surrounding the cornea, also known as ciliary flush) is seen in keratitis, acute glaucoma and other significant intraocular disorders. Examine the iris and pupil and ensure the anterior chamber is clear. Either blood (hyphaema) or pus (hypopyon) may appear as either a horizontal fluid level or generalised cloudiness of the anterior chamber. The shape of the pupil should be noted, and if irregular check if this is new or due to previous trauma or surgery. The pupil size, symmetry and reflexes must be examined. How do I measure pupil size ? or remembering that a normal cornea measures 12 x 12 mm. This enables a rough estimate to be made of the proportion that the pupil takes up and thereby its size e.g. 50% = 6mm. How do I know if the pupil is dilated or constricted? In a situation where a comparison cannot be made with the other eye or it is clinically important to judge if the pupils are dilated or constricted, the normal range for the size of pupils in different light conditions is often guessed. A study of pupillary size in bright (penlight or ophthalmoscope) and fluorescent light found that pupil sizes greater than 3.6 mm or less than 1.9mm in bright light, or greater than 5 mm or less than 2mm in fluorescent light were likely to be abnormal13. Does it matter if repeated pupil size measurements are by the same or different observers ? Research has found high levels of agreement between observers as long as formal measurement of papillary size was undertaken with a Haab scale. Simple estimation was associated with poor correlation14. Is a difference between pupil sizes abnormal? Anisocoria (unequal pupil sizes) is found in 19% of normal subjects at any one time15 and is more apparent in the dark than the light16. Unilateral miosis may be found in the acute red eye and is more prevalent with more serious problems (e.g. keratitis, uveitis)17. The mechanism is thought to be due to release of prostaglandins in to the eye which act on the sphincter pupillae. Approximately 20% of the normal population has unequal pupils. A smaller pupil is often found in the acute red eye. How do I assess pupil reflexes? The reaction of the pupil to both direct and indirect (consensual) bright light and accommodation should be assessed and recorded. No reaction to light or accommodation is most likely due to either oculomotor nerve palsy or the use of a mydriatic drug. What is a relative afferent pupillary defect? Flash a bright light first into one eye for 2-3 seconds; both pupils should constrict. Then rapidly move to the other eye for a similar time. Normally, both pupils should remain constricted. if, once the light is moved from one side to the other, the pupils dilate, this is abnormal and represents a relative afferent pupillary defect in this case, pathology in the left eye, or optic nerve. Here is a summary of the findings and causes of abnormal eye movements. In each image, the right eye is always the abnormal one. IV (Trochlear) palsy affected eye elevated on forward gaze, accentuated on head tilting to affected side. Common causes include trauma, microvasculopathy. VI (Abducens) palsy affected eye adducted at rest and no movement on lateral gaze. Common causes include space occupying lesion , trauma, aneurysm. 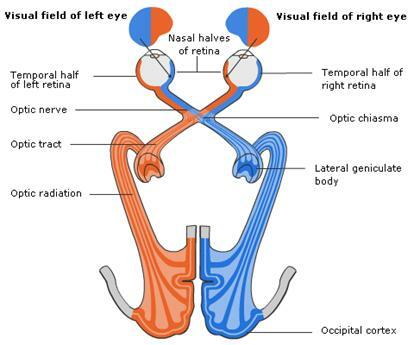 Visual field assessment is an essential component of the examination of any patient complaining of visual loss. In the ED an estimation can be made using a confrontation technique.A white topped pin is more sensitive than a wiggling finger. Fluorescein is an orange red dye that absorbs blue light and fluoresces green. It stains the tear film and only penetrates defects in the epithelium of the eye making lesions such as corneal abrasions, foreign bodies and ulcers far more visible. The most effective preparations for diagnostic purposes are either a 1% solution or a moistened floret18. Contact lenses must be removed prior to instillation as they may become permanently stained. Examination may be made easier in the painful eye if a topical local anaesthetic is instilled. Commonly used agents include tetracaine, lidocaine and proxymetacaine. Unfortunately instillation of local anaesthetic drops into the eye is painful. Attempts to reduce pain by adding sodium bicarbonate to tetracaine increased pain scores19. Research has shown that proxymetacaine is the topical local anaesthetic of choice as it produces the lowest pain scores with an equivalent clinical efficiency20. Proxymetacaine is the least painful local anaesthetic agent when instilled into the eye. There is no doubt that fundoscopy is far easier if the pupil has been dilated the sensitivity of detecting diabetic retinopathy is twice as high through a dilated than a non-dilated pupil21. Tropicamide is a short acting mydriatic but there is a commonly quoted risk of precipitating acute glaucoma. A systematic review found this risk to be approximately 1:20,00022. Even in several studies in high risk populations with chronic glaucoma, not one patient developed acute glaucoma22. Fundoscopy is more sensitive when the pupil is dilated and the risk of precipitating acute angle glaucoma with 0.5% tropicamide is extremely small. It is important to make sure that patients who have driven to the ED are aware that their vision will remain blurred until the tropicamide wears off and that they make alternative arrangements for getting home. Although not a standard technique used in the Emergency Department due to the difficulties associated with formal intra-ocular pressure measurement with an application tonometer, the development of hand held devices (e.g. Tono-pen) make this measurement easier and more accessible to the Emergency Physician.